I was at Vincent Gap high on the Angeles Crest Highway just before 4a. The road, an engineering marvel of its day when it was completed in 1956, runs for 66 miles atop the San Gabriel Mountains, on or near the crest dividing the Los Angeles Basin to the south from the Mojave Desert to the north. It's still a very cool road today. The section between Vincent Gap and Islip Saddle, five miles to the west, has been closed for four years now due to extensive slides that washed out sections of the road. 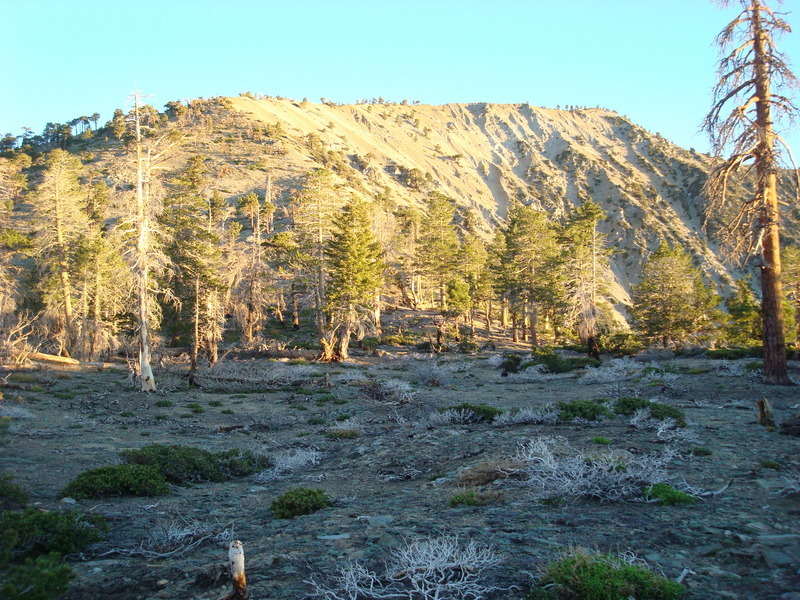 I had been to nearby Wrightwood a few times over the years, but never up as high as Vincent Gap. I drove up this way to climb the HPS peaks around the Baden-Powell area, finding it a very enjoyable outing. I got the early 4a start so that I could be atop Baden-Powell for sunrise, slated for around 5:30a. So near to the summer solstice, it did not take long for the eastern sky to begin to grow light, and before 5a I was able to turn off my headlamp. Just before the summit I came across the Waldron Tree, a venerable 1,500yr-old limber pine growing on rocky soil along the trail. It was named for an honored local leader of the Boy Scouts in the Los Angeles area. The four mile, 2,800-foot ascent took me almost exactly an hour and a half, getting me to the summit right at sunrise. It was a very nice morning, cool but not cold, and the sun came up quickly to start brightening the mountaintops. I was surprised to see Baden-Powell's shadow extend west towards the Valley over the haze, much like Shasta or Rainier in the early morning. I wandered around the Baden-Powell memorial at the top, reading the inscriptions and pondering their meaning like the good Eagle Scout I am. If it brought tears to my eyes, I'm not telling. Being the highest peak in the area, one might think that Baden-Powell is also the hardest peak to reach in the vicinity, but not so. That honor goes to Ross Mtn, barely a bump off the long South Ridge of Baden-Powell. It has maybe 100ft of prominence, but is some 2,000ft down the ridge. So the trick is the long climb back up to Baden-Powell after the descent to Ross. The good news is that the ridge makes for a delightful climb, with swell views off both sides to many of the other peaks in the area and to the Los Angeles Basin below. It took about an hour to make the descent down the ridge, a use trail helpful in places to get through a few brushy sections. The red HPS can was there atop a small pile of rocks, with signatures going back to 1995 when the register was placed by HPS veteran Carleton Shay (his 8th time to Ross!). I spent probably 20 minutes around the summit area, taking pictures and a break as well. The ascent back up to Baden-Powell took another hour and a half, and just after 8:30a I was back on top. Just before reaching the summit for the second time, I came across another solo hiker heading down to Ross. We were both surprised to find someone else heading to Ross on the same day. We chatted briefly before parting ways in opposite directions. From the summit of Baden-Powell, most of the remaining part of the hike was downhill. I followed the PCT west along the crest, tagging first Mt. Burnham (a summit cairn, but no register), then the higher Throop Peak. A plaque honoring the founder of Caltech (originally called Throop University) was placed at the summit in 1992. I could have continued along the crest to Hawkins about another mile away and to several other HPS peaks in that direction, but I decided to leave those for another day when I'll drive up to Islip Saddle from the other direction. I headed down the northwest ridge of Throop, eventually stumbling upon a no longer maintained trail that drops all the way to Dawson Saddle. A teetering sign at the TH describes how the Dawson Saddle Trail was built by the Boy Scouts some 26 years earlier but it has been neglected now for some time. It was just before 10:30a when I got to the maintenance shed at the saddle, the highpoint of the Angeles Crest Highway at 7,901ft. From the saddle I made the quick ascent up a use trail on the north side of the road to the sumit of Mt. Lewis, taking only about 30 minutes. Mt Lewis isn't particularly high and the views are muted by the trees all about the broad summit. I found a fairly new register among some rocks, placed within the last year. I looked around for an older one at all the obvious places I could think of, but was unable to discover another one. Back down at Dawson Saddle, I settled in for the two hour hike back down the road to Vincent Gap. With the highway closed and no motor vehicles whizzing by, it was a fairly pleasant walk cruising down the center of the road. A handful of cyclists plied their way up the grade as I was hiking down, with some enterprising young men using motor scooters to ferry supplies for a late-season snowboard park they were grooming in a side canyon a few miles up from Vincent Gap. For the most part, the road was in terrific shape, looking to have been recently repaved and swept regularly of debris and rockfall by Caltrans. Logs that had fallen on the road were cut and piled in several places along the road, large boulders pushed or dragged off the roadbed. There was one spot where half the road was still covered by what looked like a more recent rockfall, and nearer to Vincent Gap could be found the more serious slide that had taken much of the road with it. Caltrans was in the process of stabilizing this section, boring deep holes for a foundation and pouring concrete to shore up the hillside. It was 12:45p when I got back to the the van at Vincent Gap. The parking lot, completely empty when I had arrived in the night, was now almost full with visitors. I drove back down the highway, turning left on Big Pines Highway before reaching Wrightwood. I had one more HPS summit in the area to tag before calling it a day - Pinyon Ridge. The description seemed easy enough, and I figured I could knock it off in less than an hour. I parked along side the road at a turnout near the YMCA camp (called All Nations Camp on the 7.5' topo). I hiked up through the camp until I found a weak trail along the creek at the camp boundary. The trail crossed the dry creek several times and has been washed out in several places, but I could still follow it for more than half a mile. It eventually petered out where it crossed a dirt road traversing the north-sloping hillside. Huh? This wasn't in the description. I had no map with me for what should have been a trivial peak, not unlike Mt. Lewis, and for this I suffered. Thinking the summit must be above me (that's where they're usually found), I continued up the slope on the other side of the road, scrambling cross-country up the steep, loose dirt of the forest understory. The ascent seemed to go on and on, all the while the top of the ridge not looking any closer. I then stumbled across a trail, well-maintained, traversing the slope. Another question mark. By now I was sure I was not heading up towards Pinyon Ridge and needed a new strategy. I turned west and followed the trail to see if I could get a view through the trees to orient myself. In less than a quarter mile I came to a ridge where I could see down to Pinyon Ridge, well to the north and 300 feet below me. I had overshot the summit by more than half a mile. Rats. I was lucky to find a decent use trail descending the ridgeline to the saddle just south of Pinyon Ridge where I picked up the dirt road heading to the summit (I could have saved a lot of trouble had I followed the first dirt road I came upon to the west, where it traversed to the same saddle).